There are many ways in which you can support the FPHS Band Programs. First and foremost, the best way to support the students is by attending performances at the evening concerts throughout the school year, at Forest Park football games, and at other special programs. The next way you can support the FPHS Bands is by volunteering. Everyone has something to contribute, and the students need each and every one of you! Whether it’s chaperoning, event organization, uniforms, pit crew, or something else, parental and community involvement is imperative to the success of the FPHS Bruin Band program. Finally, we also rely on the generous financial support of our community. The caliber of program requires more financial resources than Prince William County Schools can provide. This is where the Bruin Band Boosters comes in; our fundraising provides the necessary resources to support the FPHS Band Programs. There are three general ways to donate to the Forest Park Bruin Band Boosters. Tag Day, where the Marching Band goes door-to-door in our community asking for tax-deductible donations, is our biggest fund raiser that takes place near the beginning of the school year. If you would like to mail a donation to support the Bruin Band programs, please make your check payable to FPHS BBB and mail it to: FPHS Bruin Band Boosters, Forest Park HS, 15721 Forest Park Dr, Woodbridge, VA 22193. 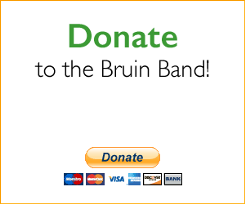 You can shop Amazon and support the Bruin Band. Amazon will donate 0.5% of the price of your eligible AmazonSmile purchases to Forest Park High School Bruin Band Boosters whenever you shop on AmazonSmile. Simply go to http://smile.amazon.com/ch/54-1997976, shop, and support the Bruins! Solo and Ensemble times for FP students are posted here - https://t.co/XIrsBHwEL7 - good luck to all! Copyright © Forest Park High School Bruin Band: A Fourteen-Time Virginia Honor Band All Rights Reserved.